It’s amazing the space certain people occupy in our minds and memories. It’s remarkable how our thoughts can capture those same people so vividly, though we don’t even know their names or stories. I haven’t visited the Boeung Keng Kong Market in years (though I recently came across a 2008 blog whose photos tell me not a whole lot has changed). 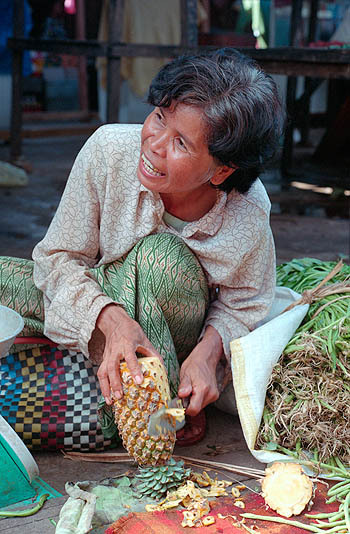 And I hadn’t thought of The Pineapple Lady in quite some time, until Jerry pulled out a stash of old negatives while searching for a particular set of 1998 photos from Laos. When he told me he found The Pineapple Lady, I knew immediately what he meant. I still don’t know her name, but I remember her smile as though we’d met again this morning. And I remember the taste of her pineapples, an epiphany of sweetness and juice that told me I’d never really eaten a pineapple before I bit into hers. It’s actually not uncommon in Cambodia to greet a person day after day and never know her name. Sometimes, the terms for “sister,” “brother,” “teacher” or “loved one” are used more often than people’s proper names. I’m sure she called me “Madame” and I’m sure I called her “Aunty.” But far more important than a name was the bond we shared through something so simple as a pineapple.